Normally on Caturday this post is an amusing LOLcat. But today it is a serious request for people in Sydney to help to raise funds to help real animals with real problems. Cupcake Camp Sydney is on Friday 28 August 2009 – REGISTER NOW. 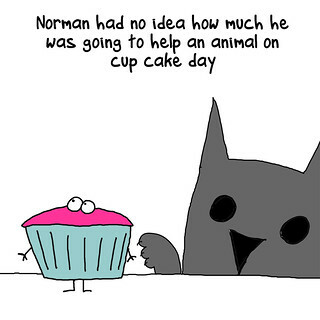 It’s a simple idea: bake or buy cupcakes; bring them to cupcake camp; share them with other people & enjoy a social occasion; and donate money to the RSPCA. There’s some great prizes for our cupcake makers – from Plantronics, Altec, Ripples Cafe – and it will be fun too! All cupcake bakers go into a draw to win a bottle of champagne too. Cupcake Camp Sydney is scheduled for Friday 28 August in Sydney & the support continues to grow. The very kind folks at Ripples Cafe at Sydney Wharf have donated a gift voucher for ‘a dinner for two’ (to the value of $150.00). It will be one of the prizes for our intrepid cupcake bakers. It is all in the cause of helping to raise funds for the RSPCA. So come along, bring your cupcakes to share. All cupcake bakers also go into the draw to win a bottle of champagne. There’s also going to be prizes for best decorated cupcake & tastiest cupcake – more on that later. After recent thoughts about leadership – just when I thought it was all sorted out in my mind – a buddy, @KerriAnne, made the point that some great leaders are truly dreadful managers. And she’s right, very rarely do we see the combination of a great leader and a great manager in the one person. Often it is a leader and second in command who work together to provide both. There’s lots of theory around management – going all the way back to the days of Machiavelli, Adam Smith, Frank Winslow Taylor, the Gilbreths (of Cheaper by the Dozen fame) or Max Weber and beyond. But the most important thing about management is that it directs the actions of groups towards common goals. All great armies in the world have had good management. That is because good management is about the creation of a cohesive group that enables individuals to put aside differing ideas, agendas and motivations to work together towards achieving group goals. Further, quite often, the group will not have had input into defining the goals that they have been asked to achieve. Management is not about the moment of inspiration so much as the daily slog of getting things done. It can often be about seemingly boring stuff, like ensuring that all necessary resources are in place when needed. Management is about keeping the team focused and capable to achieve the mission over the entire duration no matter what. Management is about knowing the skills and potential of team members, even when they might not know it themselves. It is about drawing out better performances from people than they ever suspected they could deliver. It’s also about helping people to build mastery of tasks and then moving on to new tasks so that they continually develop and grow professionally. Thus putting aside all the theory, management is about people & getting them to do things they might not want to do. Sometimes a leader can achieve this. But usually when things fall apart it is not a problem with leadership, rather it is often a problem of logistics. Thus ensuring that people have the right resources to achieve the mission is a key role for the manager. But in the past the need to coordinate activities across distant operations and with poor communications technologies meant that command and control techniques were essential tools. The military are probably the best exponents of this method of management. The key to successful command and control management is communication (there’s a nice short discussion here) – which relies upon decent computing resources and reasonable access to intelligence. And that is why the military tend to refer to C4I these days – or Command, Control, Communications, Computers, and (military) Intelligence. However, the communications technologies that we now have available to us in everyday life & in business mean that management techniques need to evolve to encompass them. Perhaps the ways of managing that made sense in the days of telegraph and radio no longer make sense in the days of social networking, converged mobile devices and the internet? For me the great challenge of contemporary management is filtering out the noise so that relevant messages can get through and people can collaborate effectively to deliver results. Over the years many of us have suffered, working under managers who are bullies. It’s time we stopped accepting the bullies way of doing things – there is some great stuff on this over at Bob Sutton’s blog on this topic. A while back Twitter was having some real problems with stability and scalability and it dawned on me that they, like many innovators, had not realised what kind of invention they had made. They talked about it as a ‘microblogging‘ platform, that is, as a very short message publishing service. This is a very web 1.0 view of what this type of platform enabled. Instead, what Twitter (and it’s competitors) enabled was conversations. And conversations enable community. So, without realising it, what they had actually created was a community building platform. One place that this is really evident is in Australia, especially in Sydney. About four years ago I recall complaining that there was no real tech community in Sydney even though there were lots of web development and hi-tech companies in town. At the end of 2007, coincident with the beta of Twitter, a number of people got together and decided to do something about it. This gave rise, or new life, to various groups. All of this could have happened using email lists and online user groups, just as it had in the past. But I’ve found that those groups are hard to maintain momentum with if you are only meeting once a week, month or similar. What you need to build real community is a village. This is because villages provide ambient contact on a regular basis that reinforces relationships and creates personal knowledge of each other as members of the community. Luckily for us Twitter came along at just the right time to provide that kind of ambient community building contact. One of the first shoots of this community in Sydney was the formation of the Sydney Twitter Underground Brigade (a.k.a. @STUB & the guys at Happener deserve kudos for their support of @STUB over the years). This was an important step in creation of a sense of community in the tech world in Sydney as it brought us together in real life on a regular basis. And that real life contact was reinforced by ongoing conversations on Twitter. Now we know what each other look like in real life and maintain contact with each other, though geographically dispersed, via Twitter. These days, if I walk into a web or tech conference in Sydney, there’s a lot of familiar faces. And all this is due to the community building that Twitter has enabled. Sure, while Twitter serves to keep us in contact regularly, the community is also supported by various blogs, wikis, Google Groups, and web pages. But it is Twitter that we use to organise and publicise a conference, or a picnic, or drinks at the pub (check out Silicon Beach drinks each Friday in Sydney). Here’s some pictures from a recent family tweetup/picnic that was enabled by (a) the community built via Twitter (most of us met first on Twitter & then in real life); (b) the ability to send both broadcast and point-to-point messages via Twitter for logistics & planning; and (c) to remind me it was on – even though I had completely forgotten to diarise it. For some reason I don’t know, tweetups in Australia became focused around TUBs (or Twitter Underground Brigades) and most big cities have a ‘TUB’ (Perth PTUB; Melbourne MTUB; Brisbane BTUB; Canberra CTUB – if I’ve missed any please let me know). The term ‘TUB’ has now become vernacular for tweetup around these part – hence there’s a fairly regular @girlTUB and a recent #familyTUB (see pics below).